For the provincial riding formerly known as Grand-Bay Westfield, see Fundy-River Valley. 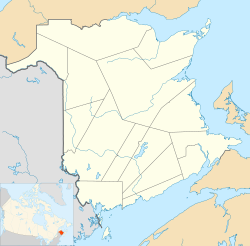 Grand Bay–Westfield (2016 population: 4,964) is a Canadian suburb outside Saint John in the western part of Kings County, New Brunswick. The town is an amalgamation of the original town of Grand Bay and the neighbouring village of Westfield immediately to the north. Grand Bay–Westfield is situated on the west bank of the Saint John River immediately north of the boundary between Kings County and Saint John County. The town is a suburb of the city of Saint John and its population is split with 3,405 residents in the Grand Bay neighbourhood and 1,544 located in Westfield. Many residents of Grand Bay–Westfield find employment in Saint John; many are tradespeople who work at the Point Lepreau Nuclear Generating Station, or the Coleson Cove Generating Station, as well as various J.D. Irving Limited pulp and paper factories and the Moosehead brewery - all located on the west side of the city. The area was discovered by Samuel de Champlain, who named Grand Bay (Grande Baie) for its wide view. Westfield is either named after Westfield, MA, where some of its settlers came from, or for its geographic location on the west shore of the Saint John River and Nerepis River. The area started out as "cottage country" for the Saint John area, and remained so for a long time (and is still considered to be so by some). Due to the steep hills and rock, the area never became heavily engaged in agriculture, although some did exist and still does. The two municipal governments were merged in 1998 with the new municipality occupying much of the western portion of King's County. In 1869 the European and North American Railway Western Extension was opened through the area between Saint John and Vanceboro, Maine. The rail line changed ownership to the New Brunswick Railway before becoming part of the Canadian Pacific Railway mainline from Saint John to Montreal in the 1880s. CPR established several stations through the area (Grand Bay, Pamdenec, Epworth Park, Ingleside, Ononette, Hillandale, Westfield Beach, Lingley, Sagwa, and Nerepis). The rail line was sold in 1995 and is now operated as the New Brunswick Southern Railway. Route 177 is the town's main road, called River Valley Drive in the Grand Bay section of town and Nerepis Road in the Westfield part. Other main streets are Woolastook Drive, which winds through the highlands of Grand Bay, and Inglewood Drive is host to the Pamdenec, Epworth Park, Brandy Point & Ingleside subdivisions on Grand Bay's shore front. Also, NB Route 102 which begins north of Fredericton ends in Westfield. Highway 7, the main route from Saint John to Fredericton, passes through the western extremity of the town. In September, 2008, part of the ground that supports the railway tracks were washed away after Hurricane Hannah. The town has a ferry landing at the end of Ferry Road in Westfield. The Westfield Ferry, a cable ferry route operated by the provincial Department of Transportation using a pair of ferries, connects Westfield with the community of Hardings Point on the Kingston Peninsula. There is a popular campground just a few feet from the Hardings Point ferry landing. The Canadian Coast Guard maintains a seasonal (summer only) search and rescue station at Brundage Point near the Westfield ferry landing. Inshore Rescue Boat Station Saint John (IRB Station Saint John) operates a Zodiac Hurricane 733 fast rescue craft in the lower Saint John River, covering all areas downstream from Evandale to the Revering Falls, including the Kennebecasis River and Belleisle Bay. IRB Station Saint John is tasked by Joint Rescue Coordination Centre Halifax. Grand Bay- These three neighbourhoods (areas around Murray St, Thompson Rd & Bayview Rd) constitute the original Village of Grand Bay. It is the downtown core of the town. Most businesses are located here and the area borders the City of Saint John, although the closest hint of an urban environment is almost 20 minutes away. Highlands/Round Lake- heavily wooded and very steep, wind through the backlands and end at Round Lake. Pamdenec- Once a former municipality (Village of Pamdenec) itself, Pamdenec amalgamated with the Village of Grand Bay in the 1970s. The town hall and fire department are located here at 609-615 River Valley Drive. Epworth Park- A former cottage community, it is nestled in the woods right on the Saint John River shore. The arena and middle school are located here. Brandy Point Estates- A suburban-type neighbourhood built in the 1970s and 1980s. Historically part of Epworth Park, it is now much larger in population than Epworth. Ingleside- The last community before Milligan Brook before you enter Westfield. Panoramic Estates- This is a new neighbourhood being built just north of the Centrum. Epworth Park Heights- This neighbourhood is west of Epworth Park and is much higher. Epworth Park Heights is very distinct from Epworth Park proper. Beverly Hills & Valley View Estates- This growing neighbourhood is located off Woolastook Drive. The streets of the area are characterized by extremely steep hills and dense woods. Brookdale Heights- A hilly neighbourhood on the edge of Milligan Brook. Brookside Park is a small garden area located near the entrance to the neighbourhood. Ononette- A very old community. Home of Unity Park. Hillandale- Also very old, Hillandale stretches along the wide Saint John River and includes the school and ferry to Hardings Point. Westfield Beach & Lingley- The former a very old cottage community, the latter a suburban-style neighbourhood stretching far back into the hills. Lingley is the last part of town to touch the Saint John River as it bends towards Brown's Flat at this point. Lingley is home to the highway exchanges from Route 177 to 102 and Route 7 to 102. The area also has a large steel bridge across the marshes at the mouth of the Nerepis River. Also, a small mobile home park is located off Carriage House Lane in the northern stretch of Lingley. Sagwa & Nerepis Station- Two very sparse communities stretching along the Nerepis River, as the Saint John River has dramatically turns towards the northeast. Sagwa is home to a small subdivision, and Nerepis is home to historic Mount Hope Farm. Nerepis Station, commonly called Nerepis is not to be confused with the separate community of Nerepis, which lies immediately to the east of this Nerepis, across the Brittain Road Bridge. Grand Bay–Westfield has many parks, from simple greenspace to ballfields and playgrounds. They are listed below, in geographical order from south to north. Henderson Brook Nature Park: A tiny, new park, Henderson Brook is a great place to watch beavers and birds. It is located on Shannon Road. Southwood Park: playground at corner of Bayview Road and Cavalier Lane. Inglewood School: playground and baseball diamond. Grand Bay Primary School: playground and fieldspace. Grand Bay Tennis Courts: 3 regulation-sized tennis courts, located at the corner of Inglewood Drive and Pamdenec Road. Pamdenec Place: simple park setting accessible from Pamdenec Road and Frederick Street. Lions Field: On Inglewood Drive near Broad Street, two ballfields and a playground. Epworth Park Field: green space at corner of Central Avenue and Smith Lane. Brookside Park: A small sitting area near the corner of Brookdale Avenue and Woolastook Drive. Unity Park: Could be considered the town's commons, this park was created to symbolize the joining of the two communities. It is located next to Milligan Brook where the former boundary was (corner of Nerepis Road and Mullen Lane). The small stage is used in the summer for events every Wednesday, including children's nights, folk music, local talent, etc. Westfield School: A large playground. Brundage Point Trailhead/Westfield River Landing: Located at Ferry Road and Brundage Point Road. ^ Canada, Government of Canada, Statistics. "Census Profile, 2016 Census - Grand Bay-Westfield, Town [Census subdivision], New Brunswick and Canada [Country]". www12.statcan.gc.ca. Retrieved 2018-06-28. This page was last edited on 31 December 2018, at 11:05 (UTC).